Welcome to the home page of IFS! Please take a moment to look at the links above - information includes membership, meetings and events. 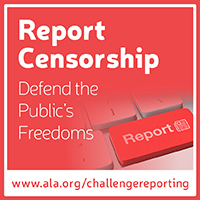 The purpose of our Section is to raise awareness of intellectual freedom issues such as censorship, protecting privacy and uphold the basic rights of patrons and those in the library community. We also provide an opportunity for training and discussion through programs at the annual conferences and other workshops and communications throughout the year.